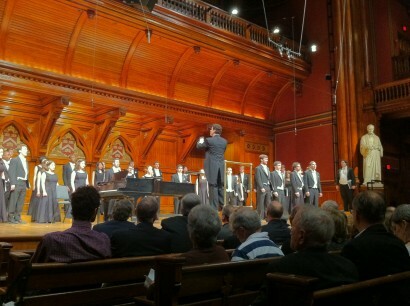 Have you heard college glee clubs lately? 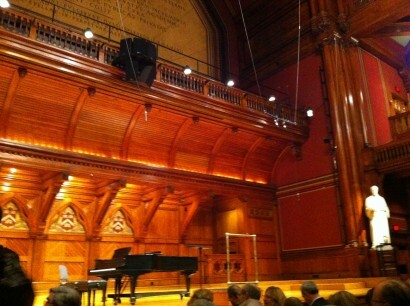 Last night I had the distinct pleasure to attend a phenomenal inaugural celebration of the combined Yale, Harvard and University of Michigan glee clubs at the lovely Sanders Theater in Cambridge, Massachusetts. Oh what a treat! The energy, the voices, the accompaniment, the venue, the crowd- it was all perfect. Each glee club performed a wonderful mix of music showcasing their breadth of talent and range and then invited alumni from the audience to join them on stage for their school football songs. 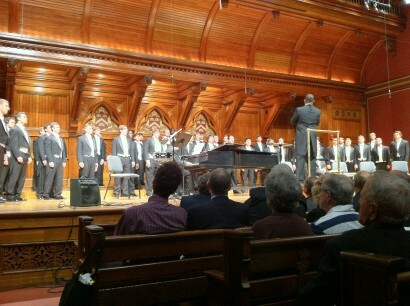 At the end of the concert all three glee clubs sang their respective alma maters as one group. I am not alumnus of any of these prestigious schools, but found myself so engaged with institutional pride that I was swept up in “Go Blue” as Michigan rocked the house. Perhaps it’s my fondness for storied, public universities in the presence of the Ivys. It was perfection.